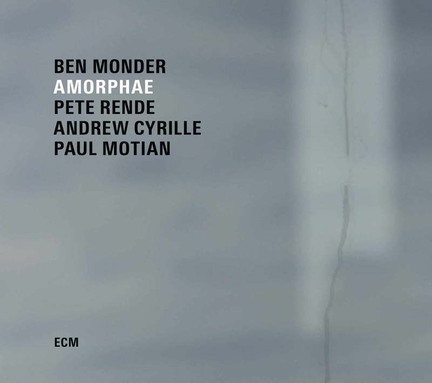 Ben Monder’s ECM debut as a leader was produced by Sun Chung, not Manfred Eicher. But from the opening solo guitar track, “Tendrils,” it is clear that Amorphae is entirely consistent with the ECM aesthetic. Few other labels trust their artists to work within such ambient quietude and nuance. Few trust their audience to be so patient and open, so capable of creative listening. The album sustains a single ethereal domain of sonorities, even though it was recorded in two sessions three years apart and uses four different combinations of players. “Tumid Cenobite” and “Hematophagy” are duos with drummer Andrew Cyrille. (Monder’s titles are hermetic, like the music.) On “Tumid Cenobite” he uses a baritone guitar, which darkens the already shadowy atmosphere. Both pieces are so glacial in their movement that some listeners (especially those who are wide awake and sober) may drop out. Those who stay the course will find the experience intriguing, even hypnotic. It is remarkable how many layers of sound Monder can produce from one guitar and one vintage Lexicon reverb unit. Cyrille offers, selectively, brushstrokes of color. On two trio pieces with Cyrille and Pete Rende on synth, the sonic landscape becomes vast but the creative process remains profoundly gradual. In one respect only, Amorphae is typical of current jazz releases: The ratio of originals to standards is 7-to-1. “Oh, What a Beautiful Morning” is a duet with Paul Motian, in one of his final recordings. Motian’s signature deft irregular accents create dramatic expectancy for the initial tentative forays of Monder, who grasps for fragments of the melody. Then Monder and his Lexicon blow this sweet song of Rodgers and Hammerstein into a wild, keening, howling storm. With more tracks like this one, Amorphae would have been a stronger and even stranger album.